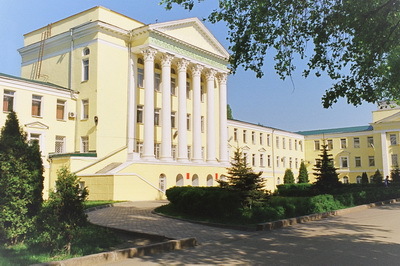 VSTU is currently a collaboration of educational, scientific, staff and technical potentials of two universities – Voronezh State University of Architecture and Construction (founded in 1930) and Voronezh State Technical University (founded in 1956)proper that are the region’s leading technical universities and provide training, re-training and professional development of employees of industrial and construction enterprises of the region. 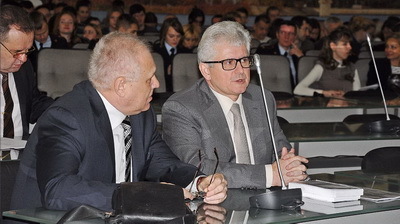 Voronezh region is one of the country’s most industrially developed hubs. Many of the city’s enterprises (Business Trust“Sozvesdiye”, Voronezh Joint Stock Aircraft Society, Voronezh Tyre Plant, Voronezh Mechanical Plant, Construction Bureau of Chemical Automation, etc.) are leading the way in the country’s industrial production. In Voronezh space rocket engines, aircrafts, modern communication devices, etc. are produced. The construction industry is one of the major ones in the country. VSTU has been training young professionals in machinery and aerospace technology, radioelectronics and information technology, energy, construction, architecture, road management, construction materials production, etc. for decades. Its researchers are engaged in studies in relevant fields. Scientific innovations of VSTU are being implemented in the region’s enterprises and are contributing to the industrial efficiency. There are a total of 20 000 students from 57 countries studying at the university. There are 8 dissertation boards for PhD and Doctor of Science training. In order to promote innovation and commercialization of scientific development, VSTU has been involved in setting up 22 small innovative enterprises. These include Ltd. “Science and Technology Centre for Micro- and Nanotechnology” (scientific research and developments in natural and technical sciences, production of semi-conductors, devices including photosensitive and optoelectronic ones), Ltd. “Scientific and Industrial Enterprise “Aviaprojekt” (development, design and testing of aviation systems and structures, development of technologies of designing aviation industry tools), Ltd. «DM SoLution» (development of software and counseling, scientific research and development in natural and technical sciences, counseling on computing technology, other activities involving the use of databases and information resources), Ltd. “VSUAC Stroyengineering” (studies and implementation of the best construction practices in soil for Russia’s climatic conditions); production of concrete structures for construction), Ltd. “VSUAC Scientific and Industrial Centre for Geodesy, Land Survey, Evaluation, Property Assessment” (scientific research and construction work in geodesy, land survey, monitoring, assessment and other relevant fields), etc. Students and young researchers are completely involved in different competitions for best innovation. Научный вестник ВГАСУ. Строительство и архитектура, все права защищены.